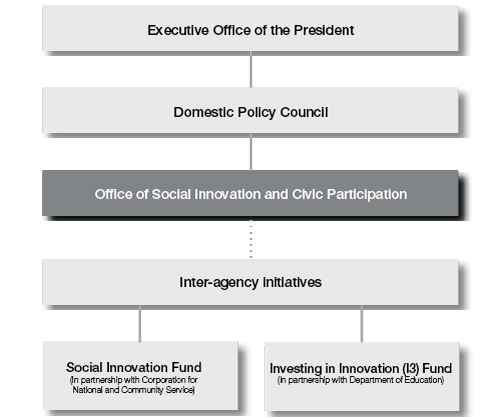 In Brief: The Office of Social Innovation and Civic Participation (SICP) is an entity within the United States’ executive branch of government that advises the US President and Executive Office on policies that encourage collaboration and innovation around such significant national challenges as poverty and education. The Office’s policy priorities include promoting service and volunteerism, increasing investment in new solutions with demonstrated outcomes and encouraging the formation of cross-sector partnerships. The Office’s focus on community-based solutions draws on a presidential mandate based on the belief that government can best support social innovation by finding and scaling existing solutions. In response to a variety of political realities, the Office was reconceptualized to include a civic participation agenda alongside social innovation, focusing on engaging Americans in volunteer and other service opportunities. The broadening of focus resulted from a combination of President Obama’s interest in promoting public service, staff capacity constraints and the opportunity to leverage Congressional momentum behind the Serve America Act, one of the first bills to pass under the Obama administration, which deals directly with volunteerism and civic participation. The Office resides within the Domestic Policy Council, an entity within the White House Executive Office. SICP is led by a dedicated commissioned officer, a high profile staff classification within the White House. Both its White House position and its high profile leadership lend SICP added stature within the government and serve in theory as a signal of the importance of SICP’s agenda. Importantly, however, SICP is not a permanent office; created at the bequest of President Obama, it is an entity that came into being by executive order rather than through legislation, such that without continued presidential support SICP could disappear in future administrations. 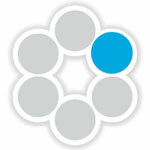 The Office of Social Innovation and Civic Participation functions as a policy advisor to the US President. As with other White House offices, the work that SICP helps to develop is either carried out by federal agencies or written into legislation and passed by Congress (for example Program-Related Investment regulation revision and the Social Innovation Fund, respectively). The Office also has the power to advise the US President on policies and programmes, and to liaise within the federal government and with a broad stakeholder community, but SICP is not primarily involved in managing, implementing or lobbying for legislation or new projects. The Office views social innovation as solving old problems in new ways, no matter where the idea originates. It is less concerned with definitional agreement on what social innovation means, focusing instead on supporting and highlighting work and organizations – whether private or public, for-profit or non-profit – that have scalable solutions to such pressing problems in the public interest as unemployment, education, and health, among others. 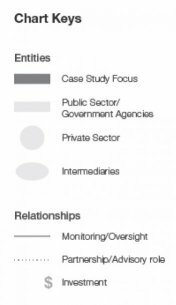 Since no institutional mandate for social innovation exists, despite its White House location, SICP depends on staff in other agencies and throughout the federal government to implement the social innovation policy agenda. Other social innovation policies, like the programmes SICP helps to put in place, may have longer staying power than SICP if the political winds shift, particularly if they have garnered legislative approval. It is important to note, however, that in politically challenging times, legislation may not be a viable route. 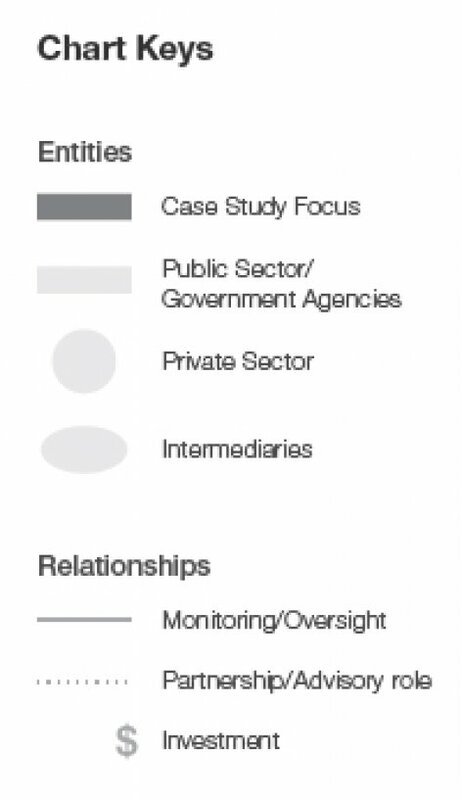 The Office has additionally supported innovation in the private investment space by encouraging the adoption of Pay for Success bonds (the US equivalent of social impact bonds), contributing to the revision of US Program-Related Investment regulation and discussing the use of bonds to support infrastructure development. The implementation of SICP was heavily reliant on the existence of key decision-makers who cared about the idea, including the US President. Creating a policy office, particularly within the executive branch, is difficult without key decision-makers to support it. Because SICP’s agenda does not fit squarely within existing social, financial or economic policy areas, it runs the risk of being overlooked. The freedom to have policy discussions with, for example, health, education and finance agencies can cultivate creativity and openness, but working with government staff whose roles are tied to existing bureaucracy can pose a challenge. CAP staff members close to the development of the ideas behind SICP were strategically placed to follow through on the execution of these ideas as part of the presidential transition team, with a president who was amenable to the office’s underlying ideas. The incorporation of a civic participation agenda reflected pragmatic decision-making, solidifying SICP’s existence with minimal to no mission drift by incorporating one of the President’s priorities with a close enough conceptual alignment to allow the Office to pursue its goals while maintaining crucial presidential support. 2 Ibid. and also see http://www.americanprogress.org/issues/economy/report/2007/12/21/3706/investing-in-social-entrepreneurship-and-fostering-social-innovation/. 8 See http://www.nasa.gov/offices/oct/home/index.html and http://www.whitehouse.gov/blog/2010/05/03/commerce-launches-new-challenge-bring-your-ideas-market-faster.